We’ve already discussed on this blog how I love things and how I love to overuse the word love. Recently, I have discovered even more things I love. I’ve also discovered that I fall in some degree of very fond liking (trying not to use the l-word) on an average of every 94 minutes. It’s sometimes with things, people, animals, whatever. Granted, that extremely fond liking of things is fleeting. I’m easily onto the next thing in a matter of…an average of 94 minutes. Recently, my love has been for strangers and carbs. On Valentine’s day, I had the fortune of an amazing Thai lunch and a flat tire. Not just a flat tire, but a fully blown out tire. I don’t know how it happened. My suspicion is that someone doesn’t love me and slashed it and this is just the beginning of some heated conflict (that would make for an entertaining show, wouldn’t it?) or…the universe wasn’t loving me that day. Either or. Standing in front of my car with two of my besties, completely helpless, we all picked up our phones and dialed for dads. No dads answered. Then, like a knight in a pickup truck, the kindest stranger asked if we needed help and ended up changing my tire. I loved that stranger for 16 minutes of my life. Then I moved on to loving the pita bread I bought at Sam’s Club. Which leads me to sharing this recipe. Let’s go. 1. Mix cucumber with salt and let sit for 10 minutes to draw out some of the liquid. Strain and squeeze in a paper towel. 2. Mix greek yogurt, sour cream, garlic, olive oil, lemon juice, vinegar and cucumber. 3. Chill for an hour before serving. 1. Slice chicken breasts into 1/2 inch strips, mix with all the spices and oil. Marinate for at least 30 minutes. 2. Grill pieces of chicken or cook under oven broiler until cooked through. 3. 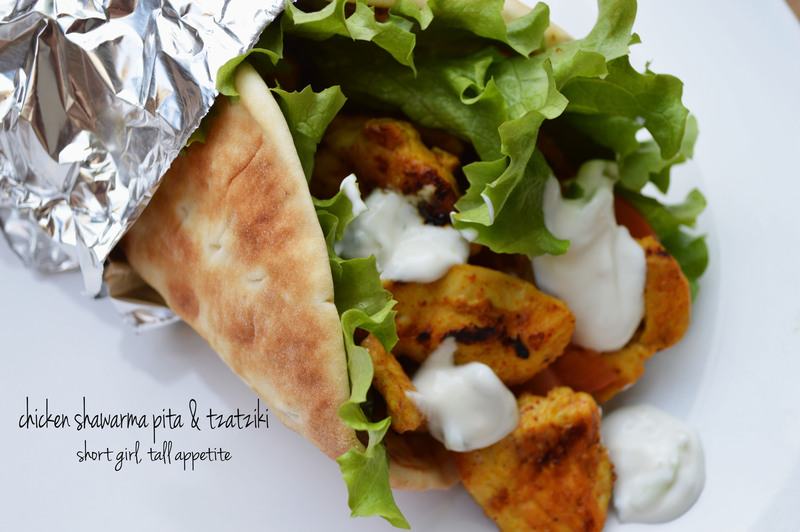 Serve with warm pita, tzatziki, lettuce and tomato. 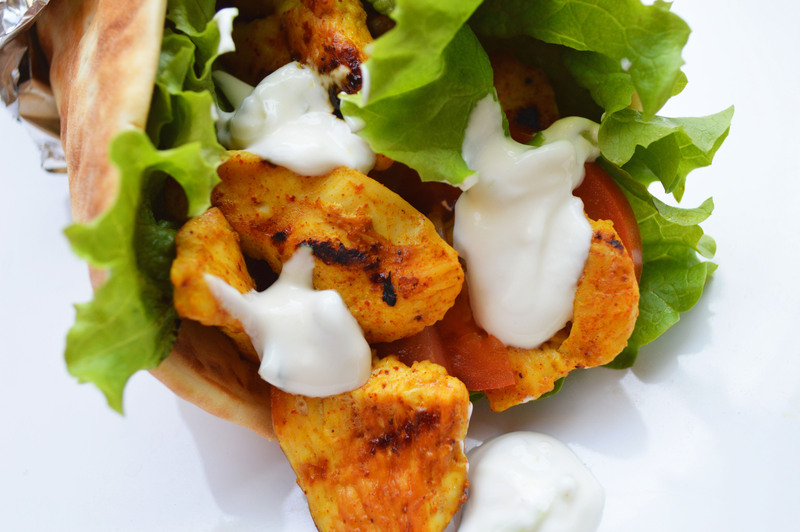 This entry was posted in Chicken, Dinner, Sandwiches and tagged chicken, chicken shawarma, greek, grilled chicken, pita, sandwich, sauce, shawarma, tzatziki. Bookmark the permalink.